Creativity development is a nonlinear and multifaceted process starting early in life. 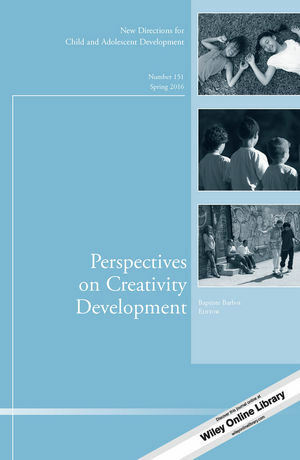 This new thematic issue incorporates recent insights into the intersection of creativity research and developmental science. Specifically, it addresses the development of creativity with a focus on childhood and adolescence with a multidisciplinary perspective, including developmental, neurobiological, intercultural, educational, psychosocial, and differential approaches. The neurobiological basis of creativity in childhood and adolescence. Commentaries by established proponents of the field integrate meaningfully these multiple insights on creativity development, as a reference for developmental scientists, creativity researchers, and practitioners. This is the 151st volume in this Jossey-Bass series New Directions for Child and Adolescent Development. Its mission is to provide scientific and scholarly presentations on cutting edge issues and concepts in this subject area. Each volume focuses on a specific new direction or research topic and is edited by experts from that field. Baptiste Barbot is an assistant professor in psychology at the Department of Psychology, Pace University, New York, and an adjunct assistant professor at the Child Study Center, Yale University, Connecticut. This editorial note provides a brief context for the volume and acknowledge all the contributions. This article discusses how creativity is necessarily tied to content and should therefore be understood as a domain-specific entity as it develops. In this article, pretend play in young children is discussed as an important antecedent of adult creativity given the commonality of cognitive and affective processes involved. This article reviews and interprets creativity slumps in light of the interaction between individual-level resources, task-specific demands, and environmental influences. This empirical study offers a psychometric approach to understand how culture may shape the structure and development of creativity. This article reviews research from the field of developmental cognitive neuroscience showing the role of inhibitory control in creative problem solving. In this article, the development of creativity in adolescence is interpreted in light of adolescent’s brain and behavioral control processes development. This article introduces an empirically testable model of creative mortification and its influence on the development of creativity of children and adolescents. This commentary underscores some of the key ideas in the volume and pinpoints issues with the concept of Big C creativity, lack of cultural relativity, and inappropriate testing of divergent thinking. This commentary challenges the concept of creative potential (vs. creativity) outlined in the volume and organizes the contributions in a proposed ability × motivation framework of creativity development.